Allison Faith (Owen) Clark, age 35 of Greenville, OH passed on Wednesday, April 3, 2019. Born on September 6, 1983 in Bowling Green, Kentucky, daughter of Perry & Germaine (Martin) Owen. Allie had worked and managed at Fiesta Salon in Greenville, OH being voted the 3rd Best Stylist in Darke County in 2019. 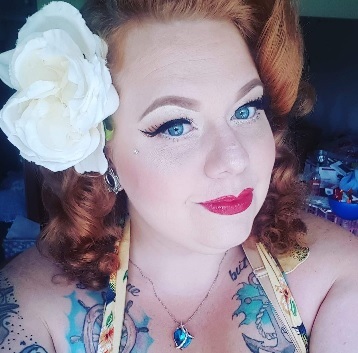 Allie was the director of the Patriot Pin Ups in Dayton, OH, known as Miss Kitty DeVille, very involved and respected in the Pin Up community. She had a Love of classic cars and pit bulls including her boys, Memphis and Nelson. Allie also had a Love for Veterans and Veteran Organizations. Preceded by her Mother, Germaine (Martin) Owen; Nephew, Joshua Paul Owen; Paternal Grandmother, Sue Morrison; Maternal Grandfather, J. V. Martin. Survivors include her Father & Step Mother, Perry & Diane Owen; Brother, Adam (Michelle) Owen; Daughter, Hannah Mary Grilliot; Niece, Reagan Owen; Paternal Grandfather, Bill Owen; Maternal Grandmother, Norma Jean Martin; Numerous Uncles, Aunts, Cousins and Friends; Forever Loved by Ken & Kristen Hoelscher. Funeral Services will be held at 10:00 a.m. CST on Wednesday April 10, 2019 in the chapel of Winn Funeral Home with Burial to follow in the Horse Cave Municipal Cemetery. Visitation will be from 5 p.m. until 8 p.m. CST on Tuesday April 9, 2019 at Winn Funeral Home and again on Wednesday morning from 8:00 a.m. until the time of service.